Vaccine Refrigerator Solar Powered Battery-powered refrigerator, 12/24V Gross Capacity: 5.8 cu. ft./163 liters Includes Solar panels Structures, charge controllers. 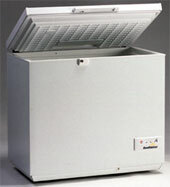 solar vaccine refrigerator/icepack freezers. Solar Power Vaccine Refrigerator/Icepack Freezer Systems developing regions.